Strolling magic or close up magic it doesn’t matter what you call it. Strolling magic is the best way to get your event going and strolling magician Steve Barcellona is an expert at setting the scene. As your guests arrive for the cocktail or social hour the party starts immediately. The idea is for people to have an appetizer and mix, mingle and maybe network. Most of the time people stand around in little groups and wait for the event to start. Strolling magic takes the pressure off everyone and gives them something to talk about. Best of all something is happening as soon as they arrive. Or maybe the type of corporate entertainment you need doesn’t lend itself to a sit down show. 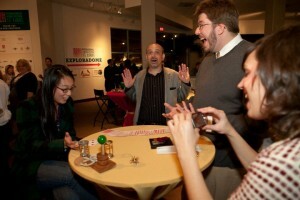 Strolling magic is the perfect way to have entertainment that fits with the flow of your event. 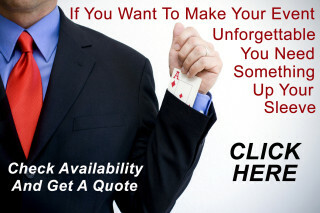 Close up magic will make sure your event is going to be a hit. Steve Barcellona is an expert mystery guest. He moves through your event and acts as your host, welcoming your guests and performing amazing sleight of hand magic, with cards, coins and borrowed objects. Everyone will be laughing and applauding as he moves from group to group entertaining your guests with their own 5 to 10 minute close up magic show. It is fun, intimate and entertaining and perfect for before dinner or receptions of any kind, but most importantly it will get everyone involved and give them something to talk about. It is a great way to get the party started. Centrally based in St. Louis, Mo and available nationwide. Contact Steve today for a free event consultation. His one goal is to make sure your event is a big hit!! You can check availability by clicking here and filling in the form. Please provide as much information about your event as you can. The fastest way to get your questions answered is by phone, you can find the number at the top of the page.